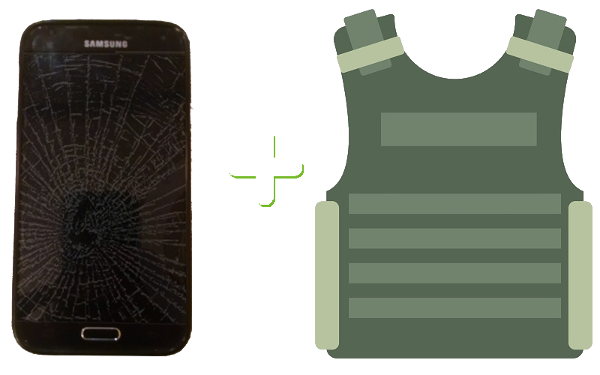 It is unfortunate to have clumsy tendencies and it is even more unfortunate when you don’t have the adequate armor on your phone to guard you against your own misgivings. I have an unconventional setup for my phone, it is a Samsung Galaxy S5 with an extended battery case. There are no rugged cases available, at all, I’ve looked. The case provided to protect the phone is a thin, high durometer, rubber case that fits sung over the phone. Unfortunately, it was not adequate for my usage and I broke my phone’s screen. Realizing this is an older phone to buy the same as a replacement was still $160 on eBay, which can admittedly be a dodgy affair, especially with a phone of this age, so I chose to have it fixed by a local shop for $120. As a result, I need to keep this phone for 12 more months before I upgrade, just my personal rule. The extended battery case for my Galaxy S5 is already rather thick, as far as phones go. The extended battery provides enough power last all day without needing to recharge it and I am not willing to give up that capability. Since I am a mechanical designer for an appliance manufacturer, with much experience, I set out to design my own case to meet my needs. Understanding the cause of my screen breakage, falling on it’s face, I wanted to create a larger standoff for the face of the screen and provide a lot of impact resistance for the sides of the case as well. After all, I am designing this against my own shortcomings. Used a caliper and small scale to measure the phone as there were no 3D models in existence I could reference. There are many, many, many cases available on thingiverse.com for a standard Galaxy S5 but not one I could find for the larger battery. Remove the “rubber glove” from the phone to slide it in. Holes to access volume, power, headphone, IR and charging port. Since the intent of this print was to test the fit, I printed it with a low infill density and of lesser quality. I wanted this print fairly quickly. I broke the case trying to fit it but it gave me the needed data to take the measurements and make the needed changes. I also noticed that my interface between the 2 halves was not robust enough and I needed more travel of the snap feature. Since I designed many snap features in the past, I should have known better than to have such a short snap as it was far too stiff and ultimately ended up breaking the case interface. After making the changes this case printed much better. It snapped together much better, didn’t split when pushed together but there was a new problem. It fit so well I could not take it apart as intended. The latch was still too stiff. The print looked good and fitting each half over the phone was tight but fit perfect. I was not brave enough to snap it together with the phone inside as I was afraid I would have to do major surgery to remove it. After some thought about how I use my phone, I had a strategy change for my phone case. I re-evaluated my criteria for this case and determined I want something that is easy to “jettison” to facilitate setting the phone on a wireless charger. I decided to change the design from a slide in and snap to a case that I can just “snap” the phone into. 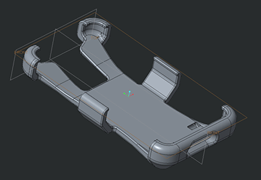 This wasn’t a major change as the way I designed the case to begin with was a base model that I broke into two two parametrically-dependent separate models. 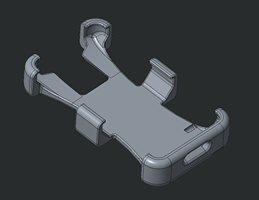 I took the base design, added more phone cavity space for the rubber outer and changed the cuts to reflect a design that would allow for the phone to snap into. After printing, there was a lot of work required to just get my phone to fit. The middle side grip features of the phone had to be shaved down to allow for easier insertion and removal of the phone. The charge port needed to be widened in order to accept the micro-USB cable which was easy work with the correct tools. This was the first case I able to use and make observations to determine what I liked and did not like about using it. The case was excessively thick and bulky and required some slimming. I wanted to reduce some of it by creating a more consistent wall thickness. Snapping on and off took annoyingly a bit too much effort. I like that it is held on well but I don’t want it held on so well that removing it is a chore. As I used the phone, I made my list to prepare for my next iteration. Modified middle clips on the phone to have a less aggressive retention interface. Other fit improvement modifications for a better fit. Made changes so the phone would be less “chunky” and have a more consistent wall thickness all around. While cleaning up the print, I dropped and broke one of the top retention clips. I was still able to make observations on the fit and make other improvements. This case is a good fit, no excessive gaps between the phone and the case and a snug fit. I have been using for several weeks now and I am mostly happy with it. Changed opening for the charging port from a hole to a “U” shape so that the USB charger can stay attached when removing and allow for easier use of the “home” button on the phone. Able to easily remove the case but does not fall off accidentally. Has [field] tested tough enough after several [accidental] drops. I added a pocket on the back to hold some cards so it also doubles as a wallet. Over all, quite happy with it. It is a bit think and clunky but it is doing what I need it to do. It has sustained several drops and is holding up to my unintentional abuse. I find that when I am at work or at home, I will often remove the case to fit the [yet] bulky phone in my pocket if I want to keep it with me. Tho, I am not a fan of using the mobile phone very much, I tend to leave the phone plugged in when in work mode and interact with it using KDE Connect from either of my openSUSE machines as to minimize the usage of it. Should you like to see the design, to emulate it, evaluate it, poo-poo on it, the STL and STEP files can be downloaded here or here. Perhaps it just might even help you out and if not, that’s okay too.